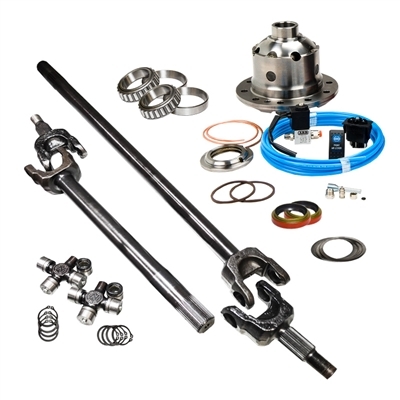 1 RT Inner Axle Shaft, 1.5" Diameter shaft. 1 LT Inner Chromoly Axle Shaft, 1.5" Diameter shaft. 35 Spline is an aftermarket upgrade. Nitro Gear: *All Nitro Gear & Axle brand products are warrantied to be free of manufacturer defects for the specified period. Warranty requests must be made by the original purchaser and submitted by the dealer purchased from. Any parts sent for warranty consideration must be pre-approved and shipped prepaid freight to our facility with copy of RGA for our inspection & determination. We will not pay for labor, shipping cost, loss of revenue or perishable goods, commercial losses, costs of telephone calls, shipping or general inconvenience. This is our only warranty expressed or implied. Unauthorized warranty returns may be refused. Warranty generally covers MFG defects in material or workmanship. Abuse, overloading, improper lubrication, misuse, commercial or competition use voids warranty. Normal characteristics are not warrantable, such as Gear whine. Minor cosmetic flaws, dings, burrs from shipping or manufacturing, are not considered defect, it is installer responsibility to address these at time of install. Customer is responsible for shipping charges if warranty is granted. Warranty is for the original purchaser/user, is not transferable. Warranty covers one replacement or credit solely at our discretion. Warranty determinations are at our sole discretion. *Air Locker Inc. (ARB) products are warranted free from defects in materials and workmanship for a period of sixty (60) months from the date of initial retail purchase, with the exception of the freezer/fridge which carries a thirty six (36) month limited warranty and ARB Air Locker which carries a sixty (60) month warranty. Air Locker Inc's (ARB) obligation under this warranty shall be limited to repairing, replacing or crediting at its option, any part found to be defective.